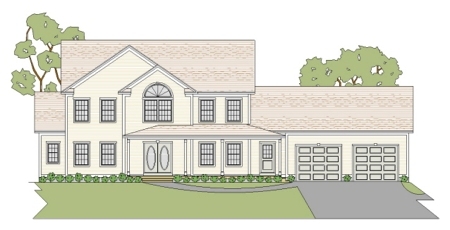 This attractive 4 bedroom modern colonial home plan has almost too many amenities to mention. The first floor has a kitchen with breakfast area, a formal dining room, a two story living room with a fireplace and cathedral ceiling that extends right through to the two story foyer, and a master suite with a sitting area. The second floor has 3 large kids rooms, a large double duty bathroom, and a lounge or play area that looks below. If the 3 car garage isn\'t large enough we can grow it for you. 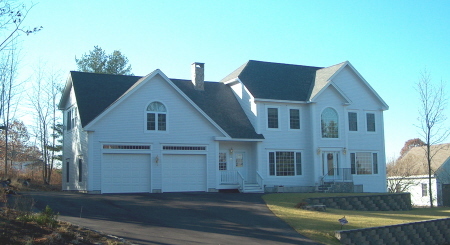 This hip roof 4 bedroom modern colonial home plan has plenty to brag about. The first floor has a New England breezeway, an open concept kitchen, living, and dining area, and a den. The second floor has 3 large bedrooms , a home office that could be a 4th bedroom, a double duty bath, a laundry, and a master suite to refresh and relax in. If the 3 car garage isn\'t big enough for you we can make it a 4 car. 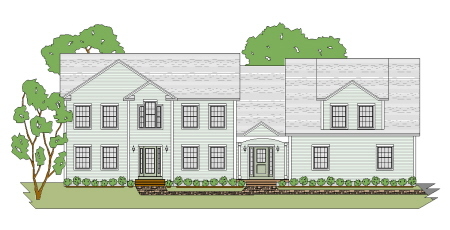 This absolutely beautiful 4 bedroom modern colonial home plan would look great any where in New England. The first floor amenities include a two story entry foyer, open concept living, a breakfast bump-out bay and a walk in pantry in the kitchen, a playroom or den, and a home office. The second floor has 3 equal size kids rooms a double duty bath, a laundry, and a great master suite with a bump out bay sitting area. What more could you ask for How about a 3 car garage? Can't you picture this on your lot? 4 BEDROOM MODERN COLONIAL HOUSE PLAN WITH A PORCH AND 3 CAR GARAGE. This first floor living modern colonial 4 bedroom home plan has a lot of class. The first floor has a 2 story entry foyer, a living room with a fireplace, a kitchen with a breakfast nook, formal dining room, a laundry and a master suite. The upstairs has 3 large kids rooms, a double duty bathroom, and a hallway that could double as a study area. The 3 car garage has full storage overhead. 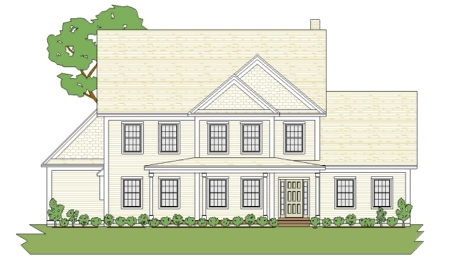 This 4 bedroom modern colonial home plan with a full length porch has a lot to shout about. The first floor has a 2 story living room, a kitchen with a bump-out breakfast bay, a formal dining area, and a laundry. 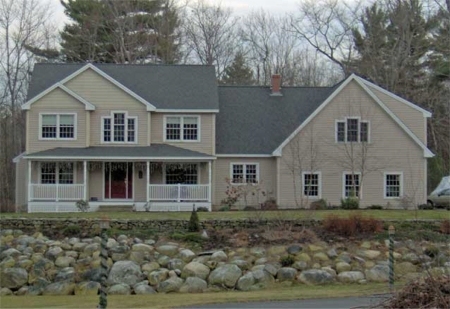 The second floor has about equal size kids rooms, a double duty bathroom, and an oversize master suite to get lost in. The two car garage could be larger if you want. 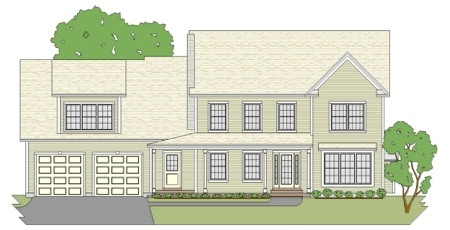 This beautiful 4 bedroom modern colonial home plan just screams "look at me". The first floor has a kitchen with a bump-out breakfast bay, a living room with a fireplace, a formal dining room and a 1/2 bath and laundry. The second floor has 3 large kids rooms and a master suite for relaxation and enjoyment. 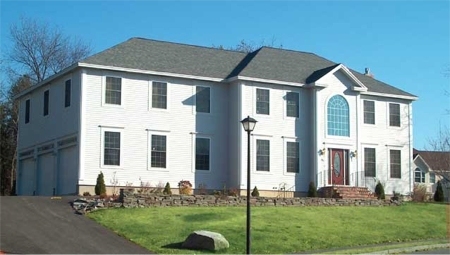 The large 2 car garage will fit 3 cars, and has easy access to the full basement. 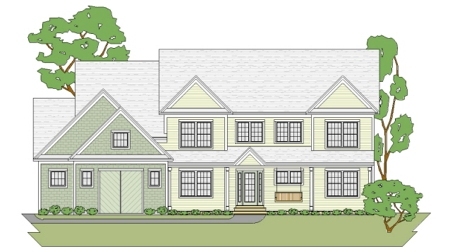 This 4 bedroom modern colonial home plan will look great in any executive development anywhere in New England. The first floor has an open concept kitchen, breakfast and living room, a two story formal dining room and foyer, and a den or home office. The second floor has 3 comfortable kids rooms, a double duty bathroom, a laundry, and a master suite you could only dream about. The 3 car garage offers easy access to the full basement. This nice looking 4 bedroom modern colonial home plan has a lot to offer. The first floor has a large country kitchen with a fireplace, a formal living room, a formal dining room, and a sun room or screen room. The second floor has 3 good sized bedrooms for the kids, two bathrooms, a laundry, a really nice master suite, and a play or study area. The 2 car garage has an easy access to the full cellar eliminating the bulkhead. This nice looking 4 bedroom modern colonial home plan has a lot to offer. The first floor has a large country kitchen with a fireplace, a formal living room, a formal dining room, and a sun room or screen room. The second floor has 3 equally sized bedrooms for the kids, a double duty bathroom, a laundry, a really nice master suite, and a large recreation room to kick back and relax. The 2 car garage has an easy access to the full cellar eliminating the bulkhead.